Cupcake, my love: Where Have I Been? OMG! I can't believe I've neglected my poor little blog! But, it was for good reason, I've had some family members fall ill that need some lovin', which left no time for bakin'. Everyone is doing much better now though, so here I am, back in action. And of course I'm starting my return with the latest Tuesdays With Dorie, brought to you by Caroline of A Consuming Passion. She chose the lovely Peppermint Cream Puff Ring, which I must say I was a little nervous about. 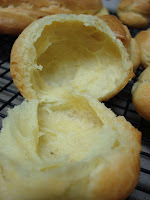 I have always wanted to make cream puffs, but for some reason was a little nervous to give it a try. To my amazement this was actually a really easy recipe to make! Since it is just Andy and I, I did make some adjustments to the recipe. First off, him and I are big mint fans, so I nixed the peppermint. 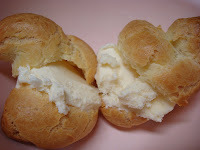 Second, there no way the two of us would've been able to eat the whole ring, and I didn't want it to go to waist, so I decided to just make individual cream puffs. And third, seeing as how I live in freakin' New Mexico, which at 9:00 in the morning is already in the upper 80's expected to reach 97 degrees by 2:00pm, I opted for vanilla ice cream instead of the cream. The moment my mouth was filled with the creamy, slightly crunchy, caramely goodness, I about died, and then asked myself why had I never made these little goodies before? I hate when you think something is going to be really difficult to make, so you put it off and put it off, then you make it, and you kick yourself for letting all those days go by, that could've been filled with cream puffs. The only downside is that since they're so easy to make, I'll probably be making them often, and starting to see my tummy begin to grow :( But...what can you do! Those look too cute! Glad to hear your family is doing well. They look yummy, and of course, with that kind of heat you need ice cream for sure. Hope everyone is on the mend. They will be smiling with treats like those around. Nice job! 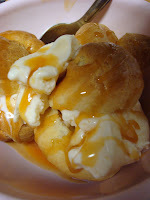 yum, those look so delicious, esp w/the ice cream! Yum--the ice cream looks like a fabulous substitution. It's been way too hot around here, too (central Texas). Welcome back. I'd happily take some of your heat as we have been getting nothing but cold, rain and thunderstorms. Not fun. These look fabulous! I love caramel sauce. 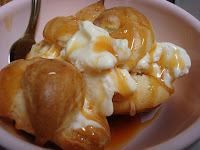 Stuffed with ice cream and drizzled in caramel... what a great way to end a hot summer day *and* find a new go-to recipe. Great job! (and I'm glad you're back and everyone's feeling better).